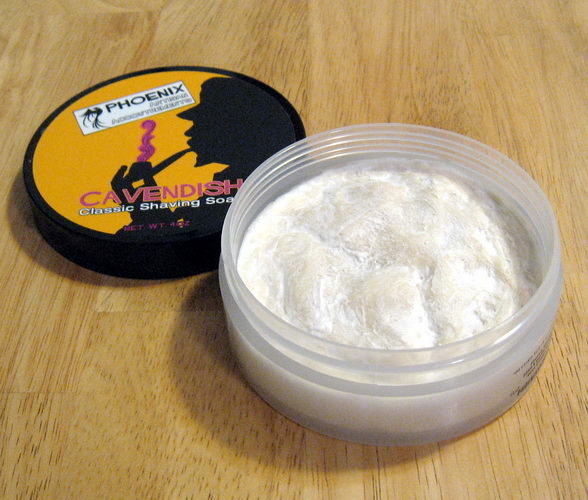 This Phoenix Artisan Accoutrements Cavendish shaving soap has been used just once. 4 oz. tub. It makes great lather. Pipe tobacco fragrance. It smells good, but not quite what I wanted. Ingredients: Potassium Stearate, Glycerin, Potassium Cocoate, Aqua, Potassium Kokumate, Sodium Lactate, Potassium Shea Butterate, Potassium Castorate, Sodium Stearate, Potassium Cocoa Butterate, Potassium Avocadoate, Parfum [Fragrance]. Retails for $14.95 + $2.97 shipping = $17.92 total. This one is yours for $13.99 shipped CONUS.